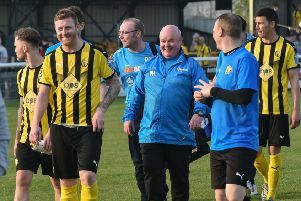 A fine goal from substitute Ross Oulton salvaged a point for Leamington in a game they really should have taken all three from, writes Paul Edwards. Brakes had a less-than-ideal preparation, arriving at Winterfield Road only half an hour before kick-off for a match that had been in doubt due to persistent rain which left the pitch badly cut up. Lee Chilton drove in a low shot that was saved by Paulton keeper Ben John as Leamington attempted to seize the early initiative to no avail. Jack Edwards came closest to breaking the deadlock before the break, receiving a pass from Ban Mackey just inside the box and moving past a challenge to clip in a low shot that struck the post. The loose ball would not sit up properly for him and his follow-up effort sailed wide. The hosts, meanwhile, were hamstrung by the five yellow cards they received during the half and this would come back to haunt them later in the game. With the weather improving slightly as the second half began, Leamington continued to search for that all-important opening, and came mightily close on several occasions. Mackey’s first-time drive was saved, with Chilton firing the loose ball wide from the edge of the box, while Lee Moore got clear of his marker to shoot low under the advancing John, only for the ball to trickle across goal and strike the inside of the post with Mackey unable to pick up the loose ball. The hosts then stunned their visitors by taking the lead with their first serious effort on goal. Leamington lost possession in their own half and the ball was played out to Kyle Tooze on the left, whose cross was crashed into the roof of the net by Darren Mullings. The injection of confidence this provided Paulton with was stark as they suddenly looked a completely different side going forward. They almost added a killer second when Tom Knighton turned both Jamie Hood and Joe Magunda on the edge of the box before sending a low drive towards the bottom corner which Breeden got the slightest of touches on to divert behind for a corner. Moore was left cursing his luck again as he hit the woodwork for the second time in the half, with his lofted shot striking the crossbar. The pace of the game became more frantic as Brakes searched for a goal and tempers frayed with more unneccary yellow cards brandished. Richard Taundry fired a free-kick over the bar before Mackey headed over from Chilton’s left-wing cross. Paulton were screaming for a penalty, convinced that a cross had struck an arm in the box, but with no decision forthcoming Ross Oulton was then fouled as he moved the ball away from goal which led to an unsightly melee as players from both sides needlessly got involved. Magunda and Breeden were both shown yellow cards, and many inside the ground believed a Paulton player received a second booking without the subsequent red. The game was screaming out for someone to show a little bit of composure and it was emphatically provided by Oulton. Picking up the ball midway through the Paulton half he set off on a slaloming run, evading the challenges of defenders who were walking a tightrope because of earlier cautions. This should in no way detract from the quality of the goal, however, as Oulton capped his fantastic run by slotting under the advancing John. Due to the stoppages there was still ample time to find a winner, but although Paulton were deflated they dug in and held out for a point.